Powers/Abilities: Mojo II did not display any specific superhuman powers, although he was a capable hand-to-hand fighter and was skilled at manipulating television networks to favor his ratings. While not specifically displayed, it seemed likely that he did possess the same superhuman strength that the original Mojo had, given his larger than average size. Whether or not he, like the original Mojo, had magical abilities that fluctuated depending on his level of power within the Mojoverse remains to be seen. Depending on his ratings and level of power within the Mojoverse, Mojo II had access to a large variety of Mojoverse technology, ranging from a levitating, spider-legged hoverchair, in which he actually resembled the original Mojo, to large prison cells and weapons, to various broadcasting and signal pirating technology. History: (X-Men II#11 (fb) - BTS) - The extradimensional media tyrant Mojo had a clone of himself created. Upon seeing the clone, Mojo considered him flawed because the clone exhibited a compassionate nature and left him on the "editing" floor. (X-Men II Annual#1) - As Mojo announced his plans to create slaves without the help of his former "toymaker" Arize, the flawed clone watched from the shadows on a video screen, remarking that they would see how successful Mojo would and wondering how long Mojo's network would withstand the stupidity of his programming decisions. The clone then mused about how long it would be before he murdered Mojo and assumed control of the Mojoverse. As he continued, the clone muttered that it would not be long at all. (X-Factor I Annual#7 (fb) - BTS) - The flawed clone created a rival network to Mojo's rule within the Mojoverse and began pirating Mojo's airwaves. (Uncanny X-Men I Annual#16 (fb) - BTS) - The clone and his agents, the Death-Sponsors, began attacking Mojo's forces, airing the attacks as bootleg transmissions. (Uncanny X-Men I Annual#16) - Riding in an spidery-legged hoverchair similar to that of the original Mojo, the flawed clone led the Death-Sponsors in attacks on Mojo's forces. During the attack, the clone reminded the Death-Sponsors that it was not the time to change programming and warned them to stick to the schedule. Announcing their attack a spectacular success, the clone explained that their attacks were successful due to the bootleg transmissions aired counter to Mojo's own transmissions. The clone continued, further explaining that they had developed a solid demographic base, causing Mojo to panic after recent programming disasters had also eroded the public's confidence in Mojo's rule. 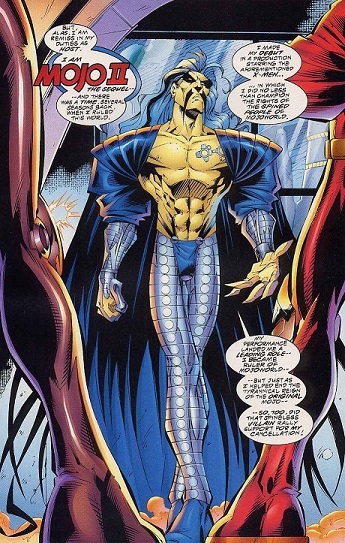 The clone then announced his plans to take the attacks not to Mojo directly, but to Mojo's failures, revealing to the Death-Sponsors that three potential ratings bonanzas had been left on Earth: Mojo's time-dancer Spiral, the "fallen messiah" known as Longshot and Mojo's former geneticist, Arize. The clone then suggested a broadcast from Earth, edited in their favor, could benefit their cause against Mojo and he ordered the Death-Sponsors to venture to Earth in the name of Mojo's death. (X-Factor I Annual#7 (fb) - BTS) - The flawed clone co-opted Mojo's airwaves to air the Death-Sponsors' failure to apprehend Arize from the X-Men's protection on Mojo's own network, using Mojo's own call signals to identify the broadcast, thereby avoiding his own ratings failure and harming Mojo's ratings by making the public believe that Mojo himself had failed. (X-Men II#10) - After Mojo seemingly killed Dazzler after an attempt to force her into his television program, the clone and his men found Dazzler washed ashore. He ordered his men to be gentle in moving her, as Dazzler was the best chance they had a pulling the final plug on Mojo. (X-Men II#11) - The clone, now calling himself Mojo II, met with the recovered Dazzler, who asked if they could get on with whatever his plans were. Introducing himself as "Mojo II: The Sequel," Mojo II reminded Dazzler that subsequent events would not be a dress rehearsal but rather, a live performance of the fall of Mojo. Explaining that Mojo's ratings were at an all-time high thanks to Mojo's airing of the X-Men fighting amongst themselves in a "Wizard of Oz" style film, Mojo II was told by Dazzler that his concern for her was only wasting daylight and that she desired to help Mojo II overthrow Mojo. A short time later, Dazzler accompanied Mojo II into Mojo Square Garden, where Dazzler asked what Mojo II hoped to gain by overthrowing Mojo. Mojo II replied that he merely gained the satisfaction of knowing he had helped those less fortunate live their own lives, to which Dazzler expressed disbelief. As they approached Mojo's throneroom, Dazzler remarked that she could hear the cheering crowds inside and Mojo II reminded her that the higher Mojo's ratings went, the further Mojo would have to fall. When Dazzler questioned how Mojo's defeat would be seen as they battled an arriving group of Mojo's soldiers, Mojo II explained that he had sent his key grips to attach a piggyback signal onto Mojo's own signal that would publicly air Mojo's defeat. He then assured Dazzler that Mojo's subjects would revolt if given even half a chance. Arriving to confront Mojo as he prepared to defeat the rebelling X-Men, Mojo II revealed himself to be the clone Mojo had earlier abandoned. When Mojo denounced Mojo II as flawed, Mojo II remarked that there were some in the Mojoverse who considered spines a virtue. Longshot and the X-Men followed behind Mojo II and Dazzler, and Longshot staged a rebellion against Mojo, eventually stabbing and seemingly killing Mojo with a sword. In the aftermath of the battle, Dazzler reunited with Longshot and the X-Men's Professor X revealed that Dazzler was pregnant with Longshot's child. Since Longshot and Dazzler would be having to raise a child, Dazzler spoke with Mojo II, explaining that he would have to be responsible for ruling the Mojoverse fairly, to which Mojo II replied he would not have it any other way. (X-Men II#46 (fb) - BTS) - A new, entertainment-free regime was founded in the Mojoverse by Longshot and Dazzler but Mojo II, still ruling the Mojoverse for Longshot and Dazzler, secretly opposed such a society. (Official Handbook of the Marvel Universe A to Z HC Vol. 7 - Mojo entry - BTS) - Mojo II sought to erase all evidence of the original Mojo's successes. (X-Men II#47 (fb) - BTS) - As part of his desire to erase the original Mojo's successes, Mojo II secretly had the diminutive X-Men clones known as the X-Babies slated for termination. (X-Men II#46 (fb) - BTS) - When the father-and-son assassins Gog and Ma'gog were tasked with collecting the X-Babies, who had fled to Earth to escape termination, Mojo II ordered them to kill the X-Babies rather than bring them back alive. (Wolverine II#102.5 - BTS) - Opting to make his opposition of Longshot and Dazzler's entertainment-free society public, Mojo II had the X-Man Wolverine captured then broadcasted footage of what he intended to be the death of Wolverine. Announcing to the public that his new televised fall line-up would involve the fall of Longshot's entertainment-free regime, Mojo II revealed his new television show Friday Night Fights, with its first fighter Wolverine, whom Mojo II planned to force to fight the Warwolves disguised as Wolverine's greatest foes. Longshot immediately overcame Mojo II's broadcast via the emergency broadcast system and warned the Mojoverse's residents to turn off their television sets, lest they build up Mojo II's ratings and doom the Mojoverse to another media-controlled dictatorship. As Mojo II's pirate network continued its airing of Wolverine's fights, Longshot, Dazzler and the diminutive X-Babies watched as Mojo II's ratings skyrocketed. The X-Babies soon burst into the fight, drawing Mojo II's attention, only to be told to sit the fight out instead of adding more to Mojo II's ratings. Eventually, the Mojoverse natives grew bored with watching Wolverine fight a one-sided fight and tuned out, taking away the ratings Mojo II had gained. Once the ratings fell to zero, the X-Babies were allowed to aid Wolverine against the Warwolves, prompting Mojo II to exclaim that the Mojoverse natives would be tuning in any time to see such a circus. As Wolverine, Dazzler, Longshot and the X-Babies defeated the Warwolves, Mojo II demanded they all get up and fight, insisting that the Warwolves would never work in the Mojoverse again and exclaiming that no one canceled Mojo II. Promising he would return, Mojo II's broadcast was turned off by Dazzler as they sent Wolverine back to Earth. (Marvel Fanfare II#4 (fb) - BTS) - Mojo II assumed control of the Palace, the royal home of the Mojoverse's ruler, from Longshot and Dazzler, forcing them to mount a rebellion against his rule. He soon began capturing and displaying those he felt lacked perfection, creating a television show designed for the public to ridicule his victims, and jailed anyone he felt like making an example of. At some point, Mojo II honored Mayor Driscoll, who had remained loyal and continued airing Mojo II's broadcasts. (Marvel Fanfare II#4) - When a Mojoverse native was confronted for not attending Mayor Driscoll's honor, Longshot and Dazzler rescued the native and Longshot located Mayor Driscoll, who attempted to kill Longshot to keep Mojo II happy. Defeating Driscoll, Longshot ordered Driscoll to inform Mojo II that he had no intention of stopping the attacks on Mojo II's forces until Mojo II stopped his oppression of the Mojoverse natives. Back at the Palace, Mojo II's lackey Pet informed Mojo II that his ratings were slipping and suggested admitting failure and allowing himself to be canceled. Mojo II refused to believe such a statement, explaining that his Zoo Highlights show was the only thing on the air. Mojo II then announced that imperfections like Pet were useless if they could not provide a way to revive ratings and questioned how much media coverage would be wasted if he was forced to kill "imperfections." Pet then reluctantly agreed to see what he could do about reviving Mojo II's shows as a package arrived with news for Mojo II. Unfortunately, the package contained delayed video of Longshot's earlier rescue and overtaking of a major city from Mojo II's rule. Pet explained that it was the fourth city Longshot and his rebels had overtaken, increasing Longshot's ratings while diminishing Mojo II's. Mojo II ordered Mayor Driscoll's execution, claiming that the incompetence of his staff was only helping Longshot's rebellion, but the captive Major Domo offered to help Mojo II boost his ratings via a televised execution. Having seen the ratings of Mojo's supposed death and Major Domo's involvement first-hand, Mojo II welcomed Major Domo's assistance, even offering to reward it. After thinking about who the Mojoverse hated that even Longshot would not rescue, Mojo II came up with the idea to execute Major Domo himself. Shortly after, Mojo II arranged a casting call for the execution, eventually choosing the time and space-dancing Spiral as executioner. Suspecting Longshot and his rebels would interfere, Mojo II soon learned that they had indeed infiltrated the Palace but when Longshot and Dazzler made their way to the Palace's center, they found a hologram of Mojo II that was televising the events. Announcing Longshot and Dazzler as special guests, Mojo II revealed a series of portals, eight of would transport the heroes to the edge of the universe, one of which would take them directly to the execution arena. When Longshot and Dazzler jumped through one of the portals, hoping Longshot's luck power would guide them to the arena, Dazzler was transported back to the other rebels while Longshot was sent to Mojo II's "zoo," where Mojo II held captive all of the "imperfections" Mojo had previously created. Mojo II then televised Longshot's battle with some of the imperfections as the rebel Quark battled the executioner Spiral. When Spiral didn't show for the execution, Mojo II replaced her but Longshot managed to escape the zoo and defeat the new executioner as the tardy Spiral entered the fray. Mojo II soon sent reinforcement soldiers when Longshot defeated Spiral but Longshot managed to escape with the rescued Major Domo and his rebel allies, much to the annoyance of Mojo II. He was soon talked out of sending soldiers to pursue, as Longshot's public battle had left Mojo II's ratings higher than ever. (Marvel Fanfare II#5) - Mojo II led an attack on Longshot's rebel camp, broadcasting the attack over his Mojo Vision network. While the attack was going on topside, Dazzler and her rebel ally Brahams were going through security checks, where they found video footage of Major Domo speaking with an unidentified person. Brahams immediately tried to turn Dazzler against Major Domo and shortly after, when Quark arrived to announce the attack above, Brahams turned on Dazzler and Quark, downing them both and announcing his loyalty to Mojo II. Above, Mojo II continued watching the battle unfold and when Longshot announced that Major Domo was in the best location for a direct attack on Mojo II, who proclaimed that things were finally getting interesting. Instead of attacking, however, Major Domo announced his loyalties to the ruling party of the Mojoverse, which at that moment appeared to be Mojo II. Shocked at Major Domo's betrayal, Longshot rushed in to attack Mojo II himself, only to be shot down by Mojo II's soldiers. Mojo II then ordered his soldiers to toss Longshot in a hole somewhere alive, as Longshot's rebels would be easier to control if they thought Longshot's life was on the line. Longshot was then throw into the rebel headquarters, where its rubble trapped him and the rebel Kragar. On the surface, Mojo II publicly announced via television the proposed execution of Dazzler and Quark, claiming that their deaths would rival even the supposed death of the original Mojo. As he continued to praise himself for bringing the public such high-quality entertainment, Mojo II also announced the betrayal of the rebel Brahams, who had secretly been loyal to Mojo II. Unbeknownst to Mojo II, Major Domo had been working with Spiral, who teleported into the rebel base to rescue Longshot and Kragar in an attempt to help Major Domo escape the rebels. 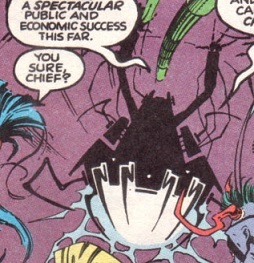 When Longshot appeared above ground thanks to Spiral's teleporting, Mojo II quickly ordered Brahams to do something, fearing that he couldn't afford to fail on television. Mojo II then ordered his soldiers to attack the rebels and when Longshot ordered Mojo II to give up his control over his subjects, Mojo II refused and ordered Pet to kill Longshot. Before Pet could fire, Major Domo turned on Mojo II, blasting him by hooking his bionic arm into Mojo II's lighting equipment. Knocked unconscious by the blast, Mojo II laid still while his soldiers debated what to do as the entire Mojoverse watched. Spiral then returned and offered to teleport Major Domo away with her but Major Domo opted to stay with the rebellion, prompting Spiral to leave him behind when she teleported away with Mojo II and his army, claiming that she wanted to see Mojo II get a star on a major network. The rebels allowed Spiral to go free with Mojo II and his soldiers. (Youngblood/X-Force (fb) - BTS) - Mojo II instituted several worldwide reforms. Eventually, a recovered Mojo rallied support for Mojo II's cancellation and Mojo II was ousted as ruler of the Mojoverse. Following his overthrow, the Mojoverse fell back under the rule of Mojo and Longshot and Dazzler's rebellion proved unable to stop a re-run of old events. Mojo II soon rejoined the rebellion against Mojo and hoped for a new media star to give the rebellion new life. (Youngblood/X-Force) - Several seasons later, shortly after the Agent tricked the extradimensional heroic group Youngblood into signing themselves with Mojo, Youngblood was transported to the Mojoworld, where they arrived in a cell next to Mojo II, who explained to the group where they were. 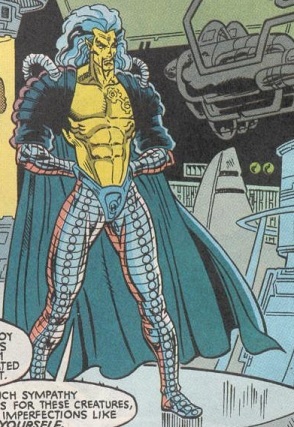 Further explaining to Youngblood, Mojo II revealed that he had recently ruled Mojoworld, having debuted in a production starring the X-Men, but had been overthrown by Mojo. His conversation with Youngblood was interrupted when Mojo's aid, Major Domo, entered the room and reminded everyone present that there was a casting call going on and they needed to negotiate their contracts. Mojo II suggested Youngblood go with Major Domo, remarking that they would speak more later. After Youngblood member Shaft had escaped through a dimensional portal and returned with the heroic mutant team X-Force, Mojo II approached both teams and revealed that Mojo had launched a successful takeover of Youngblood's home reality. Warning that they couldn't return there without boosting Mojo's ratings and power within the Mojoverse, Mojo II remarked to do so would destroy the rebellion against Mojo in the Mojoverse. The two teams then split up, with one squad agreeing to battle Mojo on Youngblood's home Earth and the other planning to sabotage Mojo's dimensional technology within the Mojoverse to prevent him access to other realities. Once the first squad had left, the second asked Mojo II and the rebel ally Ricochet Rita how to shut down the tech. Mojo II and Rita then led the second squad to Mojo's dimensional nexus, suggesting the heroes move quickly, as tampering with the nexus was an intolerable crime and would mean death if they were caught. With that in mind, Shaft suggested Mojo II and Ricochet Rita double back to create a diversion rather than risk their own lives destroying the nexus. Unsure that the heroes would know how to find the nexus' master switch without him, Mojo II reluctantly agreed to retreat with Ricochet Rita while the members of Youngblood and X-Force ventured further towards the destruction of Mojo's dimensional nexus. As he left, Mojo II suggested that the nexus could be completely shut down if a massive backlog of energy were sent through the dimensional nexus to short-circuit it, causing everyone on either side of the nexus to return to their home reality. (Wolverine Encyclopedia I#2 - BTS) - Still deposed, Mojo II continued to fight Mojo for control of the Mojoverse. Comments: Created by Fabian Nicieza, Jim Lee, P. Craig Russell, Brian Stelfreeze, Adam Hughes, Stuart Immonen, Dan Panosian, Greg Capullo, Mark Texeira, Joe Rubinstein and Harry Candelario. Mojo II did not appear in-person in Wolverine II#102.5 but rather, only on a video screen. As such, I labeled his appearance there as a BTS appearance. In his various appearances, Mojo II's hair has appeared as blue (through most of the appearances), blonde (in Wolverine II#102.5, which could just be interference on the video screen he was appearing in) and green (Marvel Fanfare II#5). Since it is blue in the majority of his appearances, I chose to list his hair as blue, with the other colors being coloring errors. His eyes also seemed to change color from red in his first appearances, to no visible irises at all, to green in Marvel Fanfare II#5. Since most of his appearances showed red eyes, that is what I'm going with in this profile. Being a clone of the original Mojo, I placed Mojo II's height at 6'9", which is Mojo's officially determined height. In all of his appearances, Mojo II appeared to be very tall so that height is likely correct. However, Mojo II's weight would be much, much less than the horrendously overweight Mojo so I approximated Mojo II's weight at around 200 lbs, based on the idea weight for his height. While X-Men II#46-47 mentioned that a new, entertainment-free regime had been founded in the Mojoverse, led by Longshot, Dazzler also mentioned that there were those that opposed an entertainment-free regime. During these two issues, it was never revealed who exactly had ordered Gog and Ma'gog to kill the X-Babies and Dazzler only mentioned that the two assassins had been tasked with collecting the X-Babies, rather than killing them, despite Gog and Ma'gog trying to explain their orders. Mojo's modern Marvel Handbook entry established that Mojo II had assumed control of the Mojoverse and sent Gog and Ma'gog to terminate the X-Babies. Since X-Men II#46-47 take place before Wolverine II#102.5, in which Mojo II is actively fighting against Longshot's entertainment-free regime, we can assume that Mojo II was one of the networks opposed to Longshot's entertainment-free regime that Dazzler mentioned in X-Men II#47. Since Dazzler only mentioned vague forces of opposition, it's safe to assume that Dazzler and Longshot at that point had no idea that Mojo II, the man that was given control of the Mojoverse at the end of X-Men II#11, was working against their regime. Therefore, when Gog and Ma'gog were ordered to collect the X-Babies, it must have been Mojo II who had secretly ordered the two assassins to kill rather than collect the X-Babies. At the time of X-Men II#46-47, Dazzler and Longshot were still highly regarded for their role in the supposed death of the original Mojo so Mojo II had not yet completely ousted their influence over the Mojoverse. By Marvel Fanfare II#4-5, Longshot and Dazzler had been completely ousted and were rebelling against Mojo II's rule. The Marvel Chronology Project website lists Wolverine II#102.5 as occurring after Marvel Fanfare II#4-5 but it actually makes more sense to have Wolverine II#102.5 occur in between X-Men II#46-47 and Marvel Fanfare II#4-5 since Mojo II is publicly opposing Longshot's entertainment-free society in Wolverine II#102.5 and in Marvel Fanfare II#4-5, the entertainment-free society has been crushed and Longshot is leading a rebellion against Mojo II's regime. Mayor Driscoll was the mayor of one of the Mojoverse's largest cities. When Mojo II took over, Driscoll remained loyal to the Mojoverse's ruling party, refusing to stop airing Mojo II's programming. To reward Driscoll, Mojo II honored the mayor and ordered the Mojoverse natives to attend. Afterwards, one of the natives who had not shown was apprehended for refusing to attend. The man was rescued by Longshot, whom Driscoll attempted to kill to win Mojo II's favor. When the entire scuffle was televised, Mojo II ordered his servant Pet to have Driscoll killed. Pet was the bipedal servant of Mojo II. Considered an imperfection created by the original Mojo, Pet was forced to serve Mojo II rather than be imprisoned alongside numerous other beings that Mojo II considered imperfect. Placed in charge of keeping Mojo II's ratings up, Pet reluctantly did as he was told while secretly harboring wishes that Longshot's rebellion against Mojo II would succeed. Upon delivering news of Longshot's overtaking of a major Mojoverse city, Pet was informed of Mojo II's seemingly unwanted desire to kill more imperfections if they could not complete their task of reviving Mojo II's programming. Pet later joined Mojo II in leading an attack on Longshot's rebel forces, where Pet viewed the battle from afar with Mojo II. When Longshot and his rebels had Mojo II in defeat, Mojo II ordered Pet to kill Longshot and Pet prepared to do as he was told despite secretly hoping that he might miss his shot. Pet was spared from having to shoot Longshot, however, when Mojo II's seeming ally, Major Domo, turned against Mojo II and blasted the despot. Following Mojo II's defeat, Pet was teleported away alongside Mojo II himself and the rest of his armies by Spiral. Pet had a feline appearance but any superhuman powers this form granted him remained unrevealed.